Horrorlair has the script here. What I like here is the ambiguity for most of the story. Is he slowly going insane or is that cute, plastic doll harboring a malevolent entity? 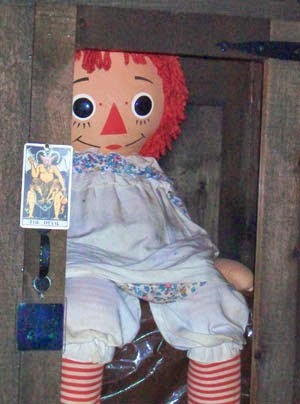 Anyway, back to Annabelle, what sane person would want this in their home? Still there? Hope I didn't cause any sudden heart attacks. 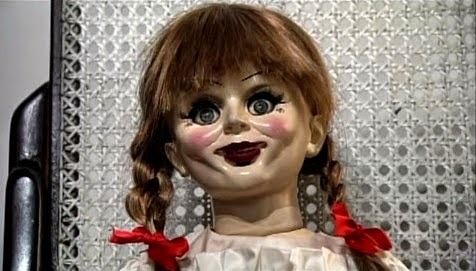 Given the right scenario, I can see how a Raggedy Ann doll with big eyes and a sweet smile could freak some people out-- especially those with coulrophobia. 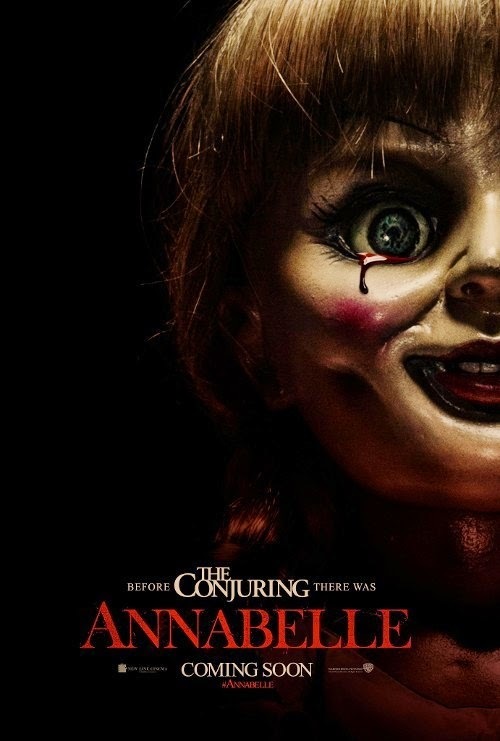 I thought Annabelle's Hollywood makeover seemed too much of a cliche, but audiences obviously disagreed. Probably one of the best examples of cinematic lightning in a bottle. Far better known properties have come and gone over the years, but this quirky sword and fantasy franchise going back to 1986 has stood the test of time -- buckled on more than a few occasions. Immortal beings of obscure origin swordfight across the ages for an even more obscure Prize. That generic premise -- along with the help of some rockin' Queen songs -- spawned conventions, books, TV shows, cartoons, merchandise, etc. Every couple of years, there's a story in the news about some sword-wielding lunatic mouthing off about, 'There can only be one'. So a reboot is in the works -- seriously this time, because there's always talk about another "Highlander" flick. I was intrigued by the lukewarm/negative script review that hit the net a few days ago, so I did a little digging and found a copy.... It's a decent action/fantasy that tries hard to satisfy the tastes of today's audiences. Think a less flashier version of "Wanted" with swords *and* guns. Hard to say if it will work. I'm pretty sure fans of the original will be pissed at the changes -- especially characterization. Some of the charm is gone, but the thing is, we tend to remember our youth being sweeter than it actually was -- can't believe I paraphrased Michael Bay of all people. Like the original, the reboot will depend on casting -- I predict oodles of cameos for rappers and MMA fighters -- action and the soundtrack. Just finished reading the script. Yet another video game adaptation -- that I’m not familiar with. The trailer gives off a strong “Constantine” vibe, to the point where folks are confounded by what appears to be a supernatural element that isn’t present in the game. The plot is pretty basic: burnt-out cop investigating the murder of his family, becomes the prime suspect in a series of bizarre killings. I was scratching my head for the first 25-30 pages. Almost gave up on it, but things start to make sense after a while. Good action. Kind of a throwback to those one-man-army action flicks from the 80s -- with some trippy visuals for today’s cgi hungry audiences. The third act is especially ambitious. Really curious to see how it comes off -- we’re talking PG-13 here. Will gamers accept some of the “interpretations” and the tame rating? Sight unseen, I think they got the wrong Mila for this. Milla Jovovich would make a far more convincing Russian Mob Princess than Mila Kunis. I don’t know about Ludacris either. 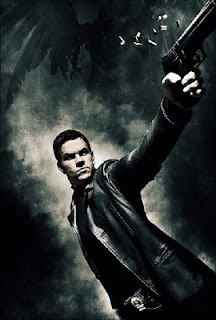 Still, nobody’s gonna confuse “Max Payne” with “King Lear”. Not a lot of deep thoughts here, but the visual eye candy promises to make up for all that. Just finished reading the screenplay off simplyscripts. Almost wish I hadn’t seen the movie first -- it’s always fun to see if the image in your head matches up with the finished product. The script definitely delivers. I’ve said it before, I like approaching a story with the idea that every character believes they’re the hero. The script/film is full of these “spotlight moments”: Alfred’s speech about the bandit, Rachel standing up to the Joker, Lucious dealing with the blackmailer, etc. Good stuff. Check it out if you haven't already. This is easily the best comic book film ever. 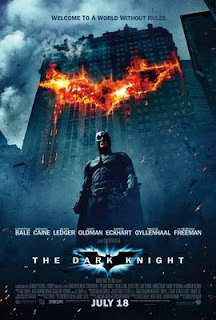 “The Dark Knight” has raised the bar so high, I’m not sure where the next crop of comic book films can go. Good luck with that darker "Wonder Woman" and “Superman” reboot. And if Chris Nolan wants Cher as Catwoman or even Gary Coleman as the Penguin, get out the way and let the man do whatever he wants!